Fr Hunwicke's Mutual Enrichment: "Invalidists"
I do not enable comments which claim, for whatever reason , that PF is not (or might not be) the true Bishop of Rome. I do not wish, on the Day of Judgement, to have to explain my collusion in encouraging souls for whom Christ died to separate themselves from His Body the Church. For similar reasons, I do not enable comments which say, suggest or imply that the Orders of the post-Conciliar Latin Church are not (or might not be) valid. There is a funny side to this. Often these idiots discuss how many ... or rather how few ... immensely aged but validly consecrated bishops there are now still left in the Catholic Church. They appear to be unaware of the existence of the sui iuris Oriental Catholic Churches, which still today continue to confer Holy Order in accordance with the rites they have uninteruptedly received from Antiquity and which were regarded as adequate for validity at the Council of Florence, and, after that, whenever a dissident community returned to the Roman Unity. One wonders why these nutty specialists on invalidity don't join Ukrainian or Melkite or Syro-Malabar or Maronite or Coptic or Chaldaean jurisdictions. Or have these also all now suddenly become 'invalid'? What weird parodies of rational argument will these people dream up to invalidate the Orders of the Catholic Orientals? But I have an additional personal reason for not enabling 'invalidist' comments. Only three or four weeks ago, I published a series "Are they really bishops?" in which I discussed this subject in case such discussion might be helpful to people who had been unsettled by Invalidists. I deployed a lot of facts. On the basis of these facts, I asked lots of questions. I have never received, from these lofty and omniscient individuals, any suggested anwers to any of my questions. So when people write asserting as unargued fact the invalidity of modern Orders, with not even a passing allusion to my articles, I take it very personally as just shockingly bad manners. So, get lost! A final warning. If sedevacantists or invalidists treat the Sacraments of the "Post-Conciliar" Church as invalid, they will be be committing sacrilege. Sacrilege is a very bad idea. God bless you Fr. John. You have been target of personal attack. Conclavists and mysticalists are better than sedevacantists or invalidists as they have their “popes” and orders. Sedevacantists or invalidists seem to know only of Roman rite and nothing of Easter rites. Simple Catholics get disturbed when they read articles of sedevacantists or invalidists that there is no valid pope since 1958 or sacraments are invalid. Your series on bishops is a help to many. To be sure, our Pope has eliminated hell from the possible destinations for the soul after death, if reports from Rome are to be taken as truth. Thanks to this Pope, I might feel safe in the sacrilege I might be inclined to commit, which, by the way, he never speaks of as a sin. All mercy all the time. Literally the law of non-contradiction, which truly exists in the mind of God, is being ignored here. Is this not also sacrilege? Father, are you praying for these invalidists and sedevacantists? "And if I should have prophecy and should know all mysteries, and all knowledge, and if I should have all faith, so that I could remove mountains, and have not charity, I am nothing." We all deserve hell, God could withdraw grace from anyone of us, it is a gift we do not deserve. We live in harsh times and God is angry at his people. "..the invalidity of modern Orders"
Any thought on those want to create a "new" order of women Deacons? At what point does any ordination become invalid? BTW, I don't question the validity of the current Latin Rite Bishop, Priestly and Deacon ordination. Dear Father, I see that the part 3 of the original post (Jan. 3, 2019) indeed has not received any comments. Probably because the comments were not enabled right after the posting. As to me, I did not check again later. I can here only refer to the critique by late Dom Athanasius Kroeger, OSB, published in Una Voce Korrespondenz in the early 70s, regarding reasons to doubt the valitity of episcopal consecration and confirmation when done using the new rite. In both cases, he did not deny that the Church can determine the form of the sacrament. The problem for him was the reasons invoked by the reformers for the change, especially, the "Oriental argument". Dom Athanasius conceded that the whole text of the new consecratory preface (even more, the whole ceremony) is explicit enough to denote episcopal order. Alas, Paul VI has defined as 'the form' not the whole preface, but precisely those words which, although being used in some Oriental rites, are NOT specific or exclusive to the episcopal consecration in those rites. Therefore, to present the example of these rites as a proof of validity does not look convincing. And the new 'form' should be justified by its own merits without enlisting help of our Eastern brethren. You are a liar when you say that there has been no response to your position. Novusordowatch.org responded on 1/16 and again on 1/22. If you are SO knowledgeable about the Sedevacantists you will know of this, but you prefer to ignore the facts about this, as about so much you say on this subject, such as how the Oriental Catholic orders would "validate" every Roman Rite "consecration" or "ordination" since 1969. Are Oriental Catholic bishops present at EVERY Roman Rite "consecration" or "ordination" since 1969 to add the validity of THEIR orders? I DON'T think so! Your ego-driven rant is fueled, of course, by the fact that you are more than aware of the fact that YOU are the "idiot" for having left one apostate, liberal "church" (Anglican) for but another apostate, liberal "church" (Novus Ordo.) Where will you go NEXT? I feel sorry for your "predicament," but as long as you are the "idiot" in these matters--in knowledgeable communion with a formal and material heretic "pope" and "church," more apostate than even the Anglicans of old, you will continue to reap the consequences of your idiocy, dear "father"! OF COURSE you won't print MY comments, will you "father"? Maybe the Sedevacantists have unintentionally internalised the wry observation of Groucho Mark who refused an invitation to join a certain group - I'd never join a group that'd have someone like me as a member. So, what is your opinion of Fr. Gregory Hesse's take on the Novus Ordo? Mr. Hunwicke, you do not deserve to be called Father any longer. A father does not take his children to drink from the poisonous waters of heresy and apostasy that stream from the mountains of Bergoglio's pontificate. You are complicit to a false pope and we (the faithful) will keep that on record until the day you die, when you will have to answer to God as to why you remained in false obedience and false human respect unto a false shepherd, when your duty was to safeguard your flock from the false shepherd. “What was awful about Lewis was not so much his politics, the rhetoric of ‘fact’ about the Incarnation or a defence of sexual eccentricity that was so much at variance with his moral doctrine, as his sermonizing, his slang and the vulgar wish not to be part of an ‘inner ring’. It was, and is, deeply unpleasant to discover that Christianity’s business is not only to create ‘little Christs’ without whom ‘all the cathedrals, clergy, missions, sermons, even the Bible itself [were] . . . a waste of time’, but also to enable those who had had a ‘wretched upbringing . . . a loathsome sexual perversion [or] an inferiority complex’ to ﬁnd Christ ﬂinging their ‘wretched machine . . . on the scrapheap’ and ‘giving [them] a new one [that would] astonish us all’. Lewis bore the marks of Inkling-speak – the language of the pipe-smoking, beer-drinking ‘jolly middle earth’ whose idea it was that Christ had avoided ‘idealistic gas’, that mankind had got into a ‘terrible ﬁx’, and that it had to avoid ‘religious jaw’ and ‘cut out’ the ‘soft soap’ which had been ‘talked about God for the last hundred years’. Father Hunwicke, in your "Are they really bishops?" articles, you mention that you won't enable comments until you've completed the series. After you completed the series, you still didn't enable comments. Perhaps this is why you said no answers have been received? That being said, perhaps you missed that between Novus Ordo Watch and Father Cekada, there have been at least 3 articles written and posted, directly responding to your "Bishops" series. I would be interested in your responses to their responses. Thank you. Does one have to read every blog in the Internet in order to avoid being called "a liar"? When I invited answers to particular precise questions, I was inviting them onto my blog. I did not receive any. I have no intention to spend every minute of my life chasing blogs. If you look back at my pieces, you will see my suggestion that those who really think that Latin orders are invalid might wish to pop off and join the Ukrainians. You appear to have been in such a rage that you failed to understand this rather obvious point. The Sede Pope, Mario Derksen, and His Secretary of State, the very funny, Fr Anthony Cekada, have been responded to at Sedevacantist Watch, at the True or False Pope Blog. Just for laughs, ABS used to respond directly to the Sede Pope, Mario, but it quickly became a drag because each time ABS would cite the encyclicals and products of The Magisterium and Tradition against his ravings, he would never respond. He'd just change the subject. He is leading men to Hell with his insane claims and his devotees are anxious to spread the Bad News that the promises of Jesus Christ that The Gates of Hell would not prevail are not worthy of belief. In effect, Pope Mario is calling Jesus a liar and the greatest deceiver to have ever lived. The wonder in observing such malign folly is to see just how many men there are who are willing to attach that anchor to their souls so that they too will fall into Hell. Owing to the diabolical deception of the Sedevacantist Sectarians, more and more men are being persuaded that willingly becoming a slave of Satan is a sort of liberation. What an incoherent article. Now you accuse sedevacantists of ignorance of Eastern Orders? What does that have to do with the Roman Rites? Paul 6 changed the Roman Rites. He based the episcopal rite on an eastern installation ceremony, not an eastern ordination rite. Now we are suppose to accept this new form as valid simply because Montini says so. He is also the man who approved the heresies of Vatican 2 which Bergoglio has just repeated in UAE. so if Latin bishops are invalid then Coptic ones are too and have been since antiquity. Of course Archbishop Bugini wouldn't let things be alone without his touch for the ages and he changed some of the grammatical cases of the prayer, but I don't think it changes its meaning (I think he changed something from genative to dative, but for example in spoken German this happens a lot without meaning being changed - "of his" vs. "(belonging) to him"
grace of high priesthood grant him the power to forgive sins as you have commanded, to assign ministries as you have decreed, and to loose every bond by the authority which you gave to your apostles. May he be pleasing to you by his gentleness and purity of heart, presenting a fragrant offering to you, through Jesus Christ, your Son through whom glory and power and honor are yours with the Holy Spirit in your holy Church, now and for ever. Pour now the power of Your Holy Spirit Whom You granted to Your Holy Apostles in Your Name. Grant this same grace to Your servant (..) whom You choose as a bishop to shepherd Your Holy flock and become a servant for You without blame and supplicate to Your goodness day and night, and gather the number of the saved, and offer oblations in the Holy Churches. Yes O Father the Pantocrator grant him through Your Christ, the unity of Your Holy Spirit to have the authority to forgive sins as a commandment of Your Only Begotten Son Jesus Christ our Lord, make the choir by his authority of priesthood, loosen all the church ties, make the new houses, churches, sanctify the altars, and pleases You by meekness and humbleness of heart as he offers you blamelessly and without blemish, a holy unbloody sacrifice of the New Covenant. That is a misconception about the installation, the prayer is used in the ordination of Coptic bishops - when a Coptic priest is consecrated a bishop the prayer used is almost the same as in the modern Roman rite an taken from the Apostolic Tradition of Hippolytus. 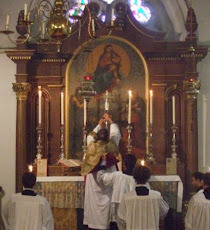 Of course I prefer for the Roman rite the old ritual but fact remains the modern Roman rite prayer comes from the same source as the Coptic one. The Prayer concerned is in a very ancient document which used to be thought to be the Apostolic Tradition of Hippolytus of Rome. It is now known not to be that document. It should not have been introduced into the Latin Rite. It is used in Eastern Catholic communities, and its adequacy has for centuries been acknowledged by Rome. They still do use it. As I've already repeated on this thread (I sometimes wonder if people read anything except what they themselves dash off), my point about the Eastern Rites was: if you have genuine problem with the validity of the Latin ordinations, why not join the Ukrainians or the Copts? I shall not now enable any more comments which simply ignore what I have myself written. It seems there are two issues that need clarification. First, is it from an eastern ordination or installation. I have heard claims that counter each other. Second, while the Coptic form you quote above seems similar, the NO form seems to have shifted an essential element from the essential form to a later prayer. The Coptic rite has the essential elements as defined by Pius XII in the essential form. It seems the NO claim to validity rests on the entire prayers counting as the essential form. Unfortunately, I don't think this passes muster. An ommision this serious in a baptism would invalidate the baptism no matter what is said in the surrounding prayers. Your thoughts? I am fortunate to have a Melkite Rite not too far away. I do not believe their ordination rites were tampered with after the council. Dear Father, i know you said you are finished with this, but I think respectful conversation can be constructive especially for future people researching this topic. while i am quite critical of Archbishop Bugini's "reforms", this bishop ordination thing bothered me for some time until i found peace of mind after researching it, i hope others can come at ease with the "reformed" ritual as myself. (this prayer might also be used in installation ceremonies of Syriac rite bishop ranks like patriarchs, hence the confusion. sadly I have yet to find English translations or even the Syriac of it. Nonetheless amongst the Copts this is it for the creation of their bishops. second clarification: i am not a sacramental theologian so I cannot, despite my desire, give you an authoritative or justified answer. however what i can say is what is effectual for the Copts must logically also be so for us, despite the fact this is not at all ideal for the Latin Church as it abandons the ancient Roman ritual and patrimony. As to what has what is needed, if i had the ability to compare the Coptic grammar with the Latin grammar (and not the English translations) the similarities of the prayer in the modern rite and the Coptic rite would be much more apparent to you. also it can be noted for what its worth that Archbishop Bugini (did I mention I am not a fan?) on his own account when "reforming" the bishop consecration rite made a point of finding an ancient source rather than himself or one of his cronies making one up, and to his surprise the Vatican didn't argue with him about it. On a final note, as Fr. Hunwicke said this reform should of never happened. Also with the exception of the Maronites, no Eastern Catholics have changed or reformed their liturgies or rituals - though keep in mind the Coptic Catholic bishops have been ordained like their Orthodox brethren with the same prayer in question and have been so since antiquity. I did not fully agree with the original three part series of Father Hunwicke, but I think he offered some valuable insight. Novus Ordo Watch and Father Cekada responded to the series. They also offer very valuable insight, but unfortunately, their entire demeanour is toxic, which to some part discredits them. I would hope for a constructive dialogue rather than mutual condemnations. Regarding the behaviour of some subjects here in this comment section, I feel rather ashamed. Have you not even a pinch of charity in your heart? As you can clearly see, this form is said with the correct matter (imposition of hands) and it invokes the Holy Spirit and the order of priesthood (bishop). There is absolutely no way this can be compared to the Rite of Paul VI. What does "governing spirit" mean? Holy Ghost or the Bishopric? It cannot be both. I know the consequences of invalid NO orders is devastating, but we cannot presume what God will or will not permit. Et nunc effunde super hunc electum eam virtutem, quae a te est, SPIRITUM PRINCIPALE, quem dedisti dilecto Filio tuo Jesu Christo, quem tradidisti dilecto Filio tuo, Domino nostro Jesu Christo quem ipse donavit sanctis Apostolis, in nomine tuo. so what is happening here, is the prayer is asking the power of the Holy Spirit, which Christ gave to the apostles be bestowed on the man to be ordained bishop so he too will have the same power of the apostles which is what is needed to a a successor to the apostles of course - which is what the episkopos (overseer/governor), the bishop, is. You see the fullness of priesthood and bishopric explicitly mentioned in the second paragraph. So Spiritus principalis would be referring simultaneously to both the grace of the Holy Spirit and the governing authority of the bishop, as in the sacramental context these things are inseparable, without the Holy Spirit there is no authority of the bishop. The Coptic ENGLISH TRANSLATION is just that, a translation from the Coptic and Greek (which would be used in their ceremonies) of Spiritus principalis and actually probably not as precise as the Catholic English translation since its captures the sovereign connotation of having authority.